Requirements: G4-based Mac with 256MB of RAM, built-in USB 2.0, Internet connection for program guides. Universal. The required 2009 shift to digital TV and growing adoption of digital TV (including high definition) still haven’t rendered analog obsolete. Many computer peripheral TV tuners can do either analog or digital, but not both. Elgato’s EyeTV Hybrid combines both analog and digital TV into one compact unit with options for analog broadcast, digital broadcast, analog cable, analog S-video input, and analog composite (RCA) inputs. For several years, Elgato has been providing digital video recorder and TV tuner solutions for the Mac. Over that time their software has evolved to offer robust options for TV viewing, recording, editing, and archiving. The US EyeTV Hybrid package comes with the TV receiver, software and manual on CD-ROM, a video cable for S-video/composite inputs, a 12″ USB extender cable, and a remote control. The TV receiver should be directly plugged into an available USB 2.0 port on the Mac. Because the device draws power from the USB bus, it does not have a separate power supply. The included USB extender cable can be used if the TV receiver blocks use of the other USB ports. A TV antenna is not included, although one is necessary for viewing either analog or digital broadcast television. Attach the antenna or analog cable input to the coaxial plug on the EyeTV receiver. Use the “breakout” cable to connect set-top boxes, video game consoles, or other playback devices. The EyeTV software is easily installed by dragging it from the CD-ROM to the Applications folder. Upon software launch, an installation key (included) must be entered; then a wizard guides through the many additional options available. For US users, a TitanTV account is setup for scheduling. European users get an account with tvtv, and Australians a free trial with icetv. Once the activation and setup are complete, the EyeTV software displays a live video window, a controller palette, and a program window with channels, schedules, and recordings. If an existing channel lineup or service provider changes, the channel and schedules can be added or reprogrammed without going through the installation wizard. The channel section in the program window conveniently provides options to change or add a service, perfect for those using the EyeTV Hybrid to view and record content while traveling. With so many other USB devices plugged into our Macs, we couldn’t help but test the TV receiver when plugged into powered USB hubs. We tested the EyeTV Hybrid with two different powered USB hubs and on two different Macs to find that, while it worked, there were occasional frame syncing and frame dropout problems. The problems were consistent even when no other USB devices were plugged in, and disappeared when the TV receiver was attached directly to a USB port on either of the computers. The inability to use powered USB hubs was a disappointment, since having the EyeTV Hybrid dangle off the back or side of a computer is less convenient for permanent usage. While the TV tuner will work with a G4 Mac, a dual G5 or Intel-based Mac is needed for 720p or 1080p HD playback. Digital broadcast signals are sent to the Mac in their original format, whereas analog signals (including composite and S-video inputs) are processed by the computer and the EyeTV software. Different live playback settings are available in the preferences, which can help with playback quality on slower Macs. With a 1.83GHz Intel-based iMac we had no problems with playback on the highest quality setting. Because the EyeTV Hybrid does not do any hardware encoding, all input and playback is live. This makes the Hybrid perfect for attaching a video game console, since there is no encoding lag between input and what is displayed on the screen. There are many useful DVR features, including pausing and replaying the live TV signal. It is also possible to watch multiple live digital programs if they are from the same digital provider. For example, many of the digital broadcast stations in our region offer multi-channel feeds with the primary content, news, weather, or music videos. These additional feeds can be displayed in a picture-in-picture window. Picture-in-picture can show recorded and live video simultaneously. For those interested in using their Mac as a comprehensive entertainment solution, the EyeTV software also works with the Apple Remote. By holding the Apple Remote’s Menu button down for five seconds, an EyeTV Menu appears instead of Front Row. 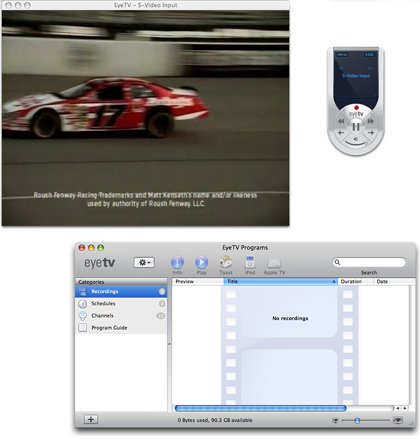 While not as elegant as Front Row, the EyeTV Menu provides options for Live TV, Recordings, Program Guide, Schedules, and Settings. As with live playback, there are recording preferences based on the desired quality and processor abilities. The MPEG-1 options are better for those using older Macs, but for those with recent machines the MPEG-2 recording is unquestionably higher quality. Of course, the tradeoff with higher quality recording is the additional amount of hard drive space required for the files. We recorded several programs and found that at the higher setting an hour of video used 5–10 GB of disk space. For those interested in frequent recording, it might be a good idea to get an additional hard drive dedicated to video use. TitanTV provides program scheduling integrated within the EyeTV software or accessed through their Web site. To record, simply click on the program desired and/or the record icon. The show will be automatically added to the EyeTV recording schedule. If there is a scheduling conflict with another program, EyeTV will ask which show to record. In the preferences and the guide settings, remote scheduling can be activated to check the TitanTV Web site for any recordings scheduled while away. Frequent travelers can then make sure their home computer records anything of interest and that the programs are waiting for them when they return. Once added to the EyeTV schedule, additional options are available for daily, weekly, or custom repeated recordings. The scheduling window also provides a feature so that recordings can be automatically formatted and exported to iTunes for syncing with an iPod or Apple TV. One of EyeTV’s more appealing features is the ability to edit unwanted content from recordings. A typical one-hour show can be reduced to approximately 43 minutes by removing commercials, making the television experience much more relaxing for viewing and archiving. Edited content also takes up less space on a disk, making it possible to fit more programs onto a hard drive or DVD. The editing window provides a “live” image of the content with thumbnail frames and a time line below. Video can be scrubbed from beginning to end by using the thumbnails, time line, or keyboard shortcuts. Unwanted content is easily marked on the time line for deletion, export, or saving as a separate clip. Recordings are easily exported with either “preset” formats or using more detailed “expert” settings. The presets provide options for e-mail, Web, iMovie, iDVD, DVD Studio Pro, Toast, PSP, Apple TV, iPod, and iTunes. MPEG program or elementary streams (without re-encoding) are also available. “Expert” choices include DV, HDV, QuickTime, MPEG-4, H.264, 3G, DivX AVI, Windows Media, AAC Audio, and Apple Lossless Audio. QuickTime files can be opened from the EyeTV file menu, viewed as with any other EyeTV recording, and exported to a new format. Roxio’s Toast is fully integrated with EyeTV for archiving to Video CD or DVD. Select the recordings to burn, click on the “Toast” button in EyeTV’s program window, and Toast is launched with the selected video already listed in the DVD menu. Any HD files will be re-encoded to standard DVD format with lower resolution. During installation, the EyeTV Hybrid and software correctly found all of our local television stations for both analog and digital broadcasts. 13 digital stations were available, and all stations were listed on the TitanTV Web site. Unfortunately, three of those stations were missing from the integrated schedule guide within the EyeTV software. When recordings were scheduled from the missing stations using the TitanTV Web page, the channels were not programmed correctly for recording. At the time of this review and after two months of requests, TitanTV does not provide information or listings for Cavalier TV, a DSL/IP digital television provider. Interestingly enough, television schedules for this service are available from other Web sites—but those sites are not integrated with EyeTV for scheduling. A new feature in the EyeTV 2.4 software is configuration for set-top boxes. The EyeTV software can schedule for set-top boxes if TitanTV or tvtv provides information for the television provider. Depending on the provider and set-top box, EyeTV can also change the set-top channel to make recording seamless. Anyone who has tried to record from a box welcomes this feature. The EyeTV software does not allow manual configuration for set-top boxes. Because TitanTV scheduling and information for our service was unavailable, we were unable to test this new feature. The only noteworthy complaint regarding the EyeTV Hybrid is with TitanTV’s lack of scheduling information for our television provider. That is primarily an issue with TitanTV, and not the Elgato EyeTV hardware or software. One solution would be for the EyeTV software to be integrated with and provide choices for other scheduling providers. The EyeTV Hybrid is a compact and affordable solution for viewing, recording, and editing digital broadcast and analog television. The software provides excellent features that are far and above most set-top PVR solutions. This product is also suited to anyone with portability and space issues, since it is easily packed away for travel and draws power from the USB bus. With both digital and analog abilities, the Hybrid is a great addition for anyone using a Mac to power their entertainment center. Copyright © 2007 Andrew Kator, akator@atpm.com. Reviewing in ATPM is open to anyone. If you’re interested, write to us at reviews@atpm.com. Thanks Andrew for a great review. I read some reviews of this device earlier this Summer. None of them gave as much detail about the number of export options for saving a recording as you did. I'm glad you mentioned the problem about setting up some set top boxes. That information was buried in some of the reviews I read. Excellent job as usual. I emailed Elgato to try and determine whether the output from a high definition set top box can be recorded in high definition. I never got an answer from them but got a quick answer from a competitor when I asked about their product. Ultimately I decided to do more research before purchasing anything. Sylvester, you were smart to check before making a purchase. At least for now, the EyeTV Hybrid can only record broadcast HD signals. All other inputs, including set-top boxes, are converted to analog at a 4:3 ratio. I was just wondering if this product would work well with my new 23 inch apple cinema display, or would it only work on my power book g4 lap top and also can I hook my coaxial cable to this and watch cable channels through this device. thanks for great overview! I have question related to recording: it happened to me several times, that the scheduled program did not get recorded. Sometimes I got just 60s of recording, sometimes it did not even started. I use just sleep status (not switching off), I do not have screen saver password. Did you - or anybody else - had simiral experience? Any suggestion? Yes, I had that experience once after three weeks of using sleep and no restarts. After restarting the computer, everything worked properly. These days I "log out" or restart at least once every few weeks. I haven't noticed any problems with EyeTV software or hardware once I started restarting every week or two. I don't think the issue is with the EyeTV hardware or software, but from many of the other applications I use. Over time there are a lot of scratch files and some occasional memory leaks, all of which should be resolved by logging out or restarting. Sorry to take so long to respond to your question. The EyeTV Hybrid must be plugged into a Mac with USB 2.0 to work. You can hook up your analog cable to the EyeTV, but your G4 PowerBook will not be able to handle any HD video either with recording or playback. It might work with recording/playback of the analog cable, but since there are many different G4 PowerBooks there is no way for me to know without testing on your specific model. My experience during testing showed that a 1.25 GHz G4 iMac can barely handle analog recording from cable or other inputs, and the live playback was often problematic with frame skipping. If no other applications were running, the G4 iMac could record. Recordings could be viewed without problems, it was the live TV signal that caused problems. Live HD TV viewing was a loss. Of course, the minimum requirements are a G5 or Intel Mac... so what I experienced was expected. You will probably experience similar issues with your G4 PowerBook. Excellent review! I can add to the TitanTV discussion that in my area (98103) I can get the specific channel lineup for my provider on TitanTV's website for analog and digital, but cannot get EyeTV to retrieve the information! I am unable to figure out why this is so... it worked for early versions of EyeTV. The tuner is very good, but it is unfortunate that unscrambled digital TV (Comcast) comes encoded in QAM for which the EyeTV Hybrid has no decoder. Consequently, I can't even watch the digital versions of local stations over cable, but it does work over the air. Thanks for the great review! Quick question... If we have cable through a provider can you directly plug the coaxial cable cord from the cable jack in the wall into the device? or does it only run off of an antenna? "crystal clear HDTV with an antenna, Clear QAM unencrypted digital cable, and basic analog cable TV, and FM radio"
So as long as you're not trying to decode encrypted channels (which is pretty much all of the upper tier of stuff beyond basic cable), then it should work. I understand the difficulties in recording HD with a G4 Mac using the EyeTV Hybrid . Are there any problems in viewing HD with a G4 processor (1.5 GHz) on a digital monitor? When I attempted using the EyeTV Hybrid on a G4, the EyeTV software limited all display and recording options to lower resolution video. If I recall correctly, the maximum was video CD (352x240) quality.